People need to have freedom to design themselves to avoid modifying the planet to fit their needs, said the world's first cyborg. Speaking to Khaleej Times on the sidelines of the World Government Summit that concluded on Tuesday, Neil Harbisson, the first person in the world to implant an antenna in his skull in 2004, said people need to embrace technology as a way that would extend their presence in reality. "The union between my body and technology revealed reality. It isn't virtual or augmented reality, it is reality that already exists but my human body cannot reveal or sense," the Catalan-raised, British-born cyborg artist said. Thanks to his antenna, 33-year-old Harbisson has a close connection to nature, cosmos and space. He can not only feel the vibrations of colours in his head and see ultraviolet and infrareds that humans don't normally experience, but he can explore space without physically having to be in a spaceship. His WiFi-enabled antenna allows him to receive colours from anywhere on the planet and connect to the space agency of Nasa. "Suddenly, my sense of colour is not on earth anymore, but in space. This allows me to explore colours of space without having to go there. I call this becoming an astronaut, instead of physically going and exploring space, we can explore space by sending our senses there," said Harbisson. He added that technology can give people a sense of space connected to their bodies that can allow them to explore new horizons without actually being there. "I see the Internet becoming a sense or a sensory expansion in us, not only a communication system." Through WiFi in his antenna, his friends can also colour his dreams. "People who have permission can send colours to my head any time of the day. If they sent me the colour yellow when I'm sleeping, my dream turns yellow, or a lion shows up." 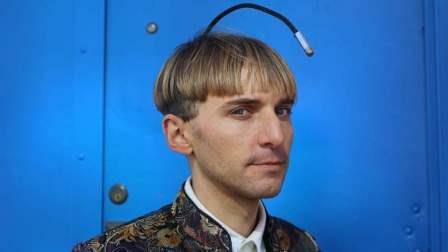 Getting an antenna, though, was not to solve the colourblindness he was diagnosed with early on. Inspired by other species, Harbisson said he wanted to extend his perception of reality through an independent organ without having to change his pre-existing senses. "There were many advantages in seeing grayscale, I had a better night vision and I could see in long distances. I didn't want to change my sight but I was interested in colours. So I thought I should create a new body part to sense colour independently from my other senses," explained Harbisson. Through the antenna, he can feel the vibrations of colour inside his head, which is a sense that does not exist in the human body, and was inspired by nature. "Dolphins, for example, have no ears but receive sounds through bone conductions. Similarly, my antenna allows me to perceive colours the same way dolphins perceive sounds. My decision was really inspired by nature not science fiction nor technology." The artist now dedicates his time to making cyborg art and giving voice to people with non-human identities through the Cyborg Foundation that he co-founded to defend cyborg rights. People, he said, should have the freedom to design themselves and instal new organs and senses. "If we had night vision, we wouldn't have had to create artificial light at night, we would save a lot of energy. If we could regulate our temperature, we wouldn't have used heaters or air conditioners to change the temperature of our planet." He added: "As species, we have been modifying the planet for thousands of years to adapt. Why don't we redesign ourselves instead? It will be better for our planet, other species and ourselves," said Harbisson. Harbisson urged for a society that accepts people who do not identify themselves as 100 per cent human. Through his foundation, he gives new organs that would help match the identity that isn't human. "Someone might want to have night vision like other animals, for example, and we work on adding that. Technology can give voice to this part that people feel is not human." Harbisson's next step is to add a new organ that will make him feel the rotation of the earth around his head. "It's a new circular organ for the sense of item to be implanted between the skin and skull to give me point of hear that will take 24 hours to finish a complete circle," he said. We've talked about how antenna helps you, but what are the challenges you're facing as the world's first cyborg? They're mostly social challenges, because people laugh when someone says they do not identify themselves as 100 per cent humans. We live with many species that are not human and we should respect them. Bioethical communities are also not accepting these new organs and senses being implanted in a body. From the ethical side, they don't accept incorporation of human and technology and argue that it is not ethical to add a non-human sense to the human body, especially if it wasn't a pre-existing organ. The World Government Summit shed light on the ethical questions that technology and AI will raise in the future. Where do you think should be the limit? I think there should be no limit to designing ourselves. I think governments should regulate how to use these new senses, not how many sense we should have. There are already regulations as to how we can use our eyes and ears, and I think governments should now address new citizens who will have the new organs. How do you see the future between robots and humans? Do you see them living peacefully together? People are afraid of robots invading us, but we should talk about AI because they are already becoming our new species. Think of Sophia, the world's first humanoid who has the Saudi citizenship. Once we start having robots, we have to live with them and learn to respect them. We are the species that has been treating others badly, such as animals and we will have to learn to respect other species. What are some common reactions you get from people about your antenna? It's been changing. Years ago, people thought it was plain weird and strange, but now there is a conversation. People are becoming more curious and are thinking of adding a new sense themselves. They feel more connected to technology that they start referring to it in the first-person perspective. Instead of saying "My phone is running out of battery," they say, "I'm running our of battery. Do you see yourself starting your own family in the future? And will you encourage them to become cyborgs? I see myself adopting children who don't have families. What I think should be done in the first 18 years of a person's life is we should teach our children to extend their pre-existing senses. We have a lot of senses like balance and weight that we are not trained to use. Schools focus on teaching children sight and smell but we should learn to identify our senses. When I have soup, I would've liked to know its ingredients by just tasting it. Then at the age of 18, people should freely decide whether they want to have a new sense.